“Trustworthy, Loyal, Helpful, Friendly, Courteous, Kind…” If those words sound familiar, then you might recognize them as the beginning of the Boy Scout Law. Those words also describe the character attributes taught to author Christopher Carosa by his parents and grandparents when he was growing up in Wonderful western New York. When he helped create Exeter Trust Company during his early 30’s, he discovered the centuries-old tradition of Trust Law and its implicit fiduciary duty coincided with these same character traits. That a sustaining business model could embody the philosophy of duty, honor and loyalty immediately impressed Carosa. The more he researched the subject of trust, the more he became one with the premise of fiduciary. In 2009, Carosa decided to explore this realm more fully by reporting on it. Already the author of one book and a contributor to another, as a well as an award-winning research piece, he began writing weekly articles for FiduciaryNews.com. Within two years he had generated the interest in thousands of subscribers, who found both the content of the materials and the style of writing appealed to them. Soon, those subscribers began asking when Carosa would compile his research and writing into a single reference book. And so, 401(k) Fiduciary Solutions was born. 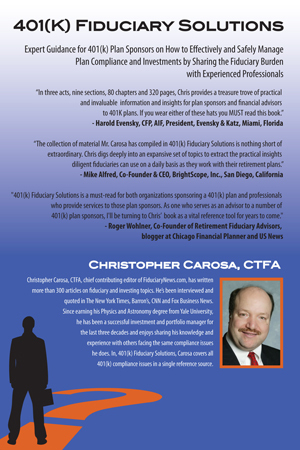 Containing both original and repurposed content, the book addresses the five key areas of fiduciary liability facing 401k plan sponsors on a daily basis. Yet, more than a mere report, it offers the collected wisdom of dozens of industry experts and thought leaders whom Carosa interviewed. In addition, 401(k) Fiduciary Solutions features several checklists 401k plan sponsors can use to help ensure their plan is the best it can be. With more than three decades of experience in the financial industry, readers can trust Carosa’s insights. He’s been a loyal advocate of all things fiduciary and 401(k) Fiduciary Solutions will prove to be a helpful “‘must-have’ manual,” says top financial blogger Roger Wohlner in the book’s forward. 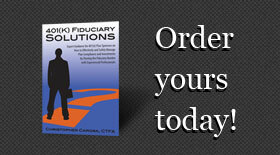 Carosa’s friendly writing style and courteous respect for different viewpoints makes 401(k) Fiduciary Solutions the kind of book you’ll want to read and re-read as you solve the day-to-day questions of operating your 401k plan. A Surprising Number of Americans Want to Live to Be 100 | Money https://t.co/2ubFcvzyZi #fiduciary #401k #IRA #Retirement about 8 minutes ago from Hootsuite Inc.
Clients postpone #retirement to pay for kids’ weddings, first homes, college | On Wall Street https://t.co/PmDB5Ab9KW #fiduciary #401k #IRA about 11 hours ago from Hootsuite Inc.
Weathering the Merger Storm | National Association of Plan Advisors https://t.co/dHQKEvu1qz #fiduciary #401k #IRA #retirement about 12 hours ago from Hootsuite Inc. Principal to Acquire Wells Fargo’s #Retirement Businesses | National Association of Plan Advisors… https://t.co/8aBkQ3Ilxg about 13 hours ago from Hootsuite Inc.
‘World’s Greatest Hacker’ Demonstrates IT Vulnerabilities | National Association of Plan Advisors… https://t.co/Wgon666A4n about 14 hours ago from Hootsuite Inc.